The Naval War College Foundation held its annual symposium in San Francisco on April 12, 2014. I attended but did not publish my thoughts immediately. I was delayed initially by a major schedule commitment I had immediately afterward. I also wanted to see if the participants' analysis could survive several months of real-world events. This article reflects my own thinking in response to the material presented. The symposium was named "How to Build a Superpower: Thoughts on China's Plan for Global Expansion." The headline topic was China, but Russian aggression in Ukraine was on everyone's minds that day. Two new terms kicked things off: "Cyber Westphalia" and Mutually Secured Systemic Resilience (MS2R). A Web search of that first term brings up links to discussions of nation-states deterring each other's aggression in the borderless domain of the electromagnetic spectrum. A search for that second term brings up nothing. One of those terms is thus fruitful for future blog articles. The key lesson is that control of the sea includes dominance of undersea telecom cables. Scale, proximity, and precision are three systemic advantages. There is no grand unified theory for large-scale complex socio-technical systems (LTSs?) available in open sources. The closest is the ultra-large-scale system (ULSS) specific to the cyber-electromagnetic domain. The ULSS does not cover the sociological aspect of the LTS. Cyber doctrine is maturing. The spectrum of cyber-EM conflict is as broad as kinetic conflict in the land, sea, and aerospace domains. Resilience in defense and targeted disruption in offense characterize cyber conflict. It is tempting to see the current US-North Korea conflict over the Sony hacking in this light. Sony was not resilient, and entire sectors of the US economy may be similarly unprepared. Targeted disruption is a perfectly appropriate response to a rogue state's encouragement of vandalism. China's digital Great Wall separating its domestic networks from the outside world is well known. Capabilities honed in suppressing dissent are very useful in stealing technology from economic competitors. Strong US intellectual property controls offer resilience in defense. China's large but uncoordinated cyber effort is spread between the state and its SOEs, opening vectors for targeted disruption. The West has capabilities but lacks will. The NWC's cyber presenter advised us to read Sun Tzu in cyber terms. Her proposed US strategy is to match deception and opaqueness to our scale / proximity / precision advantage. China's ancient Confucian mindset persists in cyber space. The Party retains the mandate of heaven so long as it delivers economic growth. Stalling growth opens a window of vulnerability. Use the bulletproof networks. China and North Korea have a contentious relationship. They are no longer "as close as lips and teeth," to borrow a translation. Japan's dominance of the dagger-shaped peninsula was an interruption of thousands of years of Chinese imperial patronage and hegemony. The large China-DPRK trade imbalance in the junior partner's favor must make Beijing wonder what it gets in return. The mandarins certainly do not get North Korea's reportedly large deposits of high-grade rare earth elements. Continued Kim family purges of KWP China hands must irk Beijing to no end. The US, China, South Korea, and Japan calibrate their regional moves as hedges against North Korean instability. No one is willing to admit in open sources whether North Korea can weaponize a ballistic missile with a nuclear warhead. This is why the US cannot rule out the outlier of a surprise strike. The inability of US elites to comprehend the North Korean nuclear program and missile program as existential threats indict their ability to safeguard a democratic society. Kim Jong-Un does not have reformist impulses. KGS NightWatch would concur. South Korea policy elites should spend as much time studying South Africa's "Truth and Reconciliation" post-apartheid process as they do with other forms of transitional justice if they wish to preserve order in a collapsed DPRK. They should also smuggle some Choco-Pies into the North to destabilize its black market. I am serious. Seoul's Blue House should read my Third Eye OSINT article on "Mishandling One of the Two Koreas" for insights into Office 39. China has an active space program. It is not a suitable partner for the US space program after our rupture with Russia. Open sources have little to say about US workarounds if China neutralizes our space assets. A resilient society has more workarounds than a closed society. China's odd approaches to legal classification and organizational structure pose analytical challenges. The inscrutable Orient was never just an Occidental myth. Anyway, the US easily falls for China's baloney about its space program. We should not be so gullible. Copying components is easier than replicating full systems and managerial competence. Great power ASAT shootouts in low-earth orbit test the international community's limited tolerance for the weaponization of space. Cold War precedents for overflight of other nations' territory offer little moral suasion to the Chinese. The US cannot successfully co-opt China into openness as long as they can steal all the IP they need. Other means of penetration become imperative. An international effort to mitigate orbital debris fields could be a ripe area for US-China cooperation. Debris is a proportionately larger threat to smaller space-faring nations (i.e., South Korea) than to those with many satellites who can afford to lose one. China watches Russia, and Russia watches China. They both covet superpower status. Each has something the other wants. Russia wants an export market for it oil and gas. China wants to test the limits of its expansionist impulse. The case for an anti-US conspiracy is weak given the history of imperial rivalries in Asia. Russian military exercises in its own far east are only nominally directed against the US; their more likely opponent is closer at hand. Russia's demographic decline and its geopolitical isolation from the West likely doom it to developing country status. Chinese encroachment into Siberia drives Russian paranoia. These two bears do not hibernate and they inhabit the same hunting grounds. Compare "The Rising Sea Dragon in Asia" to the analysis at the NWC's China Maritime Studies Institute. One source will prove to have more predictive value in about thirteen years as China's demographics overwhelm its economy's ability to deliver satisfaction. If much of this article comes across as a tease, then that is a condition my readers shall tolerate. Consider it my contribution to opaqueness. I am breaking from my usual discussion of public events by not fully disclosing many of the notes I took. Some of the insights therein are not meant to be shared. I intend to retain the strategic advantage they bring me. The departure this year of USPACOM's outspoken Naval intelligence officer is regrettable, because the red star is rising in the East. The CEO of Alfidi Capital paid close attention to tonight's national address articulating a new strategy against ISIL. Third Eye OSINT stream-of-consciousness reaction to its major points was powered by pure genius. Stand by for a recap. Making the case for emerging threats in the MENA region means understanding their sociocultural context. Radical Islam animates ISIL, pure and simple. Claiming it is not an authentic Islamic force invites ridicule in the souks of Cairo and Riyadh. Citing barbaric tactics and genocide correctly places the threat in a category requiring international response. This supports international conventions dating back decades and more recent responsibility to protect (R2P) doctrine. Air strikes are easy against equipment we recognize, i.e. captured US materiel. The US can quickly exhaust its high-value target list of easily identifiable vehicles. The harder part is destroying ISIL's very mobile C2 network of bad actors. I like the word "destroy." The US must DESTROY any armed force that threatens violence against our homeland, national leadership, or citizens abroad. The widely-shared photo of someone outside the White House displaying ISIL's flag on a smartphone proves how easily a threat can reach our own C2 nodes. The national leadership endorses strikes in Syria. Terrorists deserve no safe havens. Training and equipping proxy forces is not as easy as rhetoric makes it sound. The moderate Syrian opposition is mostly cut off and surrounded in many areas where it was formerly active, according to open source reporting. I'm pretty sure I could assess Iraqi armed forces' condition from my laptop, using open media. US advisers knew the condition of the Iraqi partners they trained all throughout Operation Iraqi Freedom. Western journalists who have covered Iraq since the US troop withdrawal in 2011 knew about the endemic corruption and incompetence in the Iraqi military. NPR's Fresh Air broadcast today discussed this in detail. Excuse me . . how and why are we enlisting Arab nations' help? Many Gulf sheikhs privately funded Syrian radicals who joined ISIL. Wealthy Kuwaitis and Qataris were willfully blind to the misuse of donated funds intended for humanitarian projects in Syria. There's nothing secret there and it's all in open source media. Ruling out US ground forces lengthens the time needed for a counteroffensive. Unready Iraqi forces cannot carry the load until they can reconstitute in safe havens far from ISIL-controlled areas. This means extensive retraining under American supervision in either Kurdistan or the Shiite south of Iraq. Referencing America's economic and scientific strength is obviously intended for a foreign audience, especially the Ebola comment. Foreign intelligence services will review the inventory of America's aid programs mentioned and ask their American ambassadors how they will benefit by joining this coalition of the willing. Ending with "vanquished from the earth" is a good call that articulates a desired end state. The US is in "it to win it" but only with air power for the time being. Air campaigns against highly mobile urban insurgencies are not effective without ground forces conducting COIN in liberated territory. US planners will eventually realize the need to introduce competent ground forces. Active-duty US military members should not make vacation plans for 2015. The American response to ISIL's emergent threat was delayed by a politically-driven unwillingness to acknowledge its potency. Echoes of that unwillingness remained audible in tonight's address. The National Security Council's mission is to synchronize threat warnings with a whole-of-government response to threats. Political operatives who supplant foreign policy professionals among NSC staffers are incapable of providing thereat warnings or staffing strong responses. The tragedy of America's new counter-ISIL policy is that it came long after the threat was obvious. It is still incomplete without a US ground force option. This concludes today's commentary. Have a nice evening. Boko Haram, a radical Islamist terror gang, abducted hundreds of Nigerian girls several weeks ago. 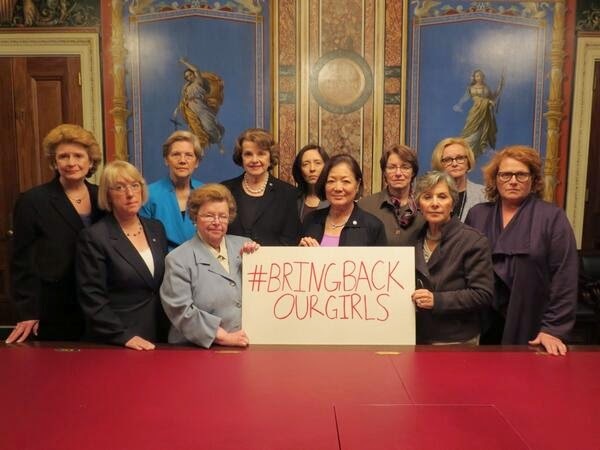 The women of the US Senate gathered in support of the #BringBackOurGirls social media meme. This is so obviously a good idea that you'd think every decent American could see the wisdom in claiming the moral high ground. Alas, America's loudest conservative pundits registered their objections to the photo below. Leading voices on the Right have denounced the photo and its meme as weak and pointless. They have no idea how wrong they are. Napoleon Bonaparte said it best: "The moral is to the physical as three to one." He meant that claiming the moral high ground is an absolute advantage in fighting a conflict. It clarifies strategic goals to allies and gives domestic morale a boost. The West is in a multi-decade struggle with radical Islam. Every time we demonstrate the moral clarity of Western Civilization, we rally neutral people in the developing world to our cause and force jihadis to explain their atrocities. The anti-female rhetoric I've heard from my conservative colleagues on this photo is disgusting. They sound pathetic by trotting out old misogynistic stereotypes that working women have tried hard to banish. The language some Americans have used to describe the Senators is the kind of verbiage a Salafist sheikh might use to describe his harem. That is not the face America should present to the world. These hashtags aren't just photo ops anymore. Social media that goes viral now drives strategic decision making. This is the power of "information operations" and I assure you that plenty of people in the US national security establishment take crafting these narratives very seriously. If you disagree, consider how the US will benefit once we share credit for the girls' safe return. I'd like to know if any of my fellow conservatives see the irony in all of these anti-hashtag comments in light of the Democratic Party's charge that the GOP engages in a "war on women." I've seen a bunch of comments criticizing women for wanting girls to be safe. Meanwhile, the US is doing what it can to help Nigerians bring them back. Do any of you see how getting behind this message sends a powerful signal to Africans who wonder whether the US stands with their hopes? Seriously, I'd like some answers. Do any of you conservatives know what millions of Africans are saying right now? They are openly questioning the radical Islamic groups that have grown throughout the continent. They do that specifically because of this incident's notoriety. Getting Americans on the right side of that message is a powerful adjunct to our diplomacy. Do you people really not see this? This isn't about Benghazi. I'm less interested in placing blame for past oversights than in solving a present problem. American leaders made plenty of missteps in the Cold War but our bipartisan foreign policy won in the end partly because our messaging to the world was based on a morally sound foundation. Messages of freedom, dignity, and prosperity matter, just as Ronald Reagan taught us with "Morning in America." Ronald Reagan also taught us that America would not tolerate Islamic terrorists getting away with the Achille Lauro hijacking; he told other would-be murderers, "You can run, but you can't hide." I believe the Gipper would be totally on board with hunting down Boko Haram fighters and rescuing their captive girls. I'm throwing it down right now, people. Anyone who disagrees with what these women Senators have to say in their hashtag should put up a photo of themselves with a #Don'tBringBackTheGirls tag. I dare you to do something that stupid. See how well that plays in 2016 when Hillary's operatives run the "GOP anti-women" canard all over again. I am amazed that Republicans are willing to cede the moral high ground to both Democrats and Boko Haram out of pure spite. Conservatives should be better than this if they are to convince Americans that the GOP is fit to govern. It is true that US foreign assistance programs are sometimes messy. It is difficult to advance a freedom agenda in authoritarian countries. We succeeded in countries like South Korea and Thailand even though they had military governments for part of their modern history. Engagement is hard. The alternative is to cede contested countries to powers that have clear anti-West agendas. I'll take the 50% solution if I think it can get to 100% with continued US involvement. Republicans can't seem to say anything positive about Administration figures who have this crisis on their radar. Hmmm, the Democrats are doing nothing but tweeting? I guess the Democratic President who directed our national security team to work with the Nigerians doesn't count. I know exactly how capable the US can be and that's why all of the partisan criticism I'm seeing here is handcuffing the GOP. Partisanship during the Cold War stopped at the water's edge, and our bipartisan foreign policy won that competition with the Soviet Union. Today's conservatives (thanks to some Tea Party nutcases) have so little positive news to offer America that they can't resist harassing our own female political leaders. American conservatives have done a whole lot more than make themselves look like fools. They have missed a golden opportunity to demonstrate American resolve in the face of the violent jihadi movements they claim to hate so much. The conservative loudmouths criticizing the #BringBackOurGirls meme have a profoundly immature understanding of information operations. They have in fact aligned themselves in support of Boko Haram. I am tired of American media reports that describe Russian forces "massing" east of Ukraine. The unclassified aerial photos NATO released from DigitalGlobe show Russian forces staged, not massed. Massing involves fire and maneuver directed at a decisive point. The Russian forces are in a "sitzkrieg" awaiting the outcome of partisan contests inside Ukraine. The SACEUR says the masked men are playing for keeps. Those masked men are doing their own sort of massing at various decisive points, and the firing they've done so far has been mostly non-lethal. BTW, the "mass" principle of war is clear in US doctrine. Other military traditions have their own principles of warfare. Massing means concentrating forces in action, not sitting around, but the American media approaches military commentary without any nuance. Partisan action against the Ukrainian government is focused on a few highly visible urban centers. This presents Ukraine with multiple opportunities to show media observers what massing really means if they ever get their act together. A sufficiently bloody recapture of a city hall or police station from the mysterious masked men of "Novorossiya" will give Russia the pretext it seeks to . . . mass its forces against Ukraine's forces. Russia's annexation of Crimea is complete and there isn't much the West can do to reverse the result. Moscow obviously did not plan this operation overnight. Airlifting thousands of troops to Crimea and deploying a naval blockade of Ukrainian ships in their ports required planning that must have predated the Sochi Olympics. The international community must understand Russia's strategic rationale for the annexation to anticipate its next moves. Begin with the past to understand the future. Historical memories of Galicia, Ruthenia, and the Donbas / Donets Basin are very much alive for ethnic Russians. It is difficult for citizens in the individualistic Anglo-West to imagine the hold that ancient stories have on some modern peoples. Modern Russians have not forgotten the Ukrainian 14th Waffen SS Division's actions in WWII. The mere mention of any of these memories is enough to stoke Russian nationalism. Ukrainian memories of the Holodomor are just as vivid, and just as easily fire the imaginations of right-leaning Ukrainian nationalists. Language matters as much as history. The post-Yanukovych revolutionary government in Kiev repealed a law recognizing the status of the Russian language. This was a major flashpoint for ethnic Russians in Crimea and eastern Ukraine. The wide commingled use of both the Ukrainian and Russian languages is not much of a unifying factor in the Ukrainian national identity. Yugoslavia had an extensively commingled ethnicity, yet the Croats and Serbs went to war anyway in the 1990s. Ukraine's assembly from parts of Poland and Austria-Hungary in the 20th century is just as tenuous as Yugoslavia's architecture without support from all of Ukraine's strongest neighbors. Diplomatic recognition of Ukraine's pre-2014 borders never offered such assurance. The Budapest Memorandum on Security Assurances assuring Ukraine's sovereignty and territorial integrity is not a treaty. It is an instrument that allowed Ukraine to surrender its legacy Soviet nuclear weapons and accede to the Non-Proliferation Treaty. It does not commit its signatories to go to war if one of them violates the agreement. It merely commits them to consultations. This commitment has the force of international law but has no clear enforcement mechanism. The memorandum thus invites an attempt to breach it; Russia took its chance with Crimea and succeeded. Angela Stent shared some insights on the US-Russia relationship while publicizing her book The Limits of Partnership at the World Affairs Council in San Francisco this March. I was present in the audience and gleaned two major points the US often overlooks about Russia. First, she said that the Russian narrative of the "Soros conspiracy" had little substantiation during the Orange Revolution. I believe this is a Western perception. The US should not rule out the possibility that Russian intelligence services promulgated the narrative to stir up anti-foreign sentiment in Ukraine. Second, she noted that Russia supported the US response in Afghanistan and expected the US to accommodate its sphere of interest in Europe. President Putin believes the US let Russia down by pushing NATO expansion. The US doesn't recognize that Russia sees its contraction in the 1990s as chaotic and humiliating. NATO promptly forgot its promise to Mikhail Gorbachev not to deploy troops into the former East Germany or admit new alliance members. Mere mention of these humiliations stokes Russian policymakers' nationalism. The West is left to wonder what else Russia seeks to achieve in Ukraine. East Ukraine's heavy industries have significant economic links to Russia. Natural gas pipelines through Ukraine deliver Russia's gas exports to Europe. Western Europe's dependency on Russian gas is not so dire, as Russia cannot cut off gas to Ukraine without cutting off gas to Europe as well. Russia's newest territory in Crimea remains vulnerable to Ukrainian attempts to control its gas and fresh water supplies. There is no land link from Crimea to Russia's Kuban region, which interestingly enough has a large population of ethnic Ukrainians. The Yanukovych government in Kiev had agreed with Russia to build the long-planned Kerch Strait Bridge connecting Crimea to Russia. The provisional government in Kiev after the events of early 2014 obviously had little interest in proceeding with this project. Russia must secure a land corridor from its territory to Crimea to ensure that peninsula's viability. Moldova's breakaway Transnistria region has demanded unification with Russia for some time. The Ukrainian oblasts of Luhansk, Donetsk, Zaporizhia, Kherson, Mykolaiv, and Odessa constitute a land corridor that secures Russian access to both Crimea and Transnistria. Third Eye OSINT stands behind its judgment that Russia will continue to foment unrest in eastern and southern Ukraine. Ethnic Russian provocations of Ukrainian government overreactions will provide the strategic pretext for Russian military intervention in this land corridor. Memories of the "Galician" SS Divison's actions against Russians are easy to stir among irredentist Russians. These memories translate as calls for the mother country's intervention. History never ended in this part of the world, and its frozen conflicts are thawing out for action. Russia controls Crimea. The rapid deployment of airmobile forces and subversion of Crimean political institutions presented the world with a fait accompli. The pending referendum on Crimea's future presents voters with little choice, because the only ballot alternative to a union with Russia is a return to autonomous status under a Ukrainian constitution that is no longer in force. The world must now consider Russia's further options. Russia's stated intent to protect "compatriots" who are not Russian citizens establishes a strategic doctrine for intervention in other countries. Russia used its veto power to nullify a UN Security Council resolution that would have upheld Ukraine's established borders against the Crimean referendum. Effective action to counter Russian intervention in Ukraine now lies outside the UN diplomatic machinery. The Crimean peninsula is heavily dependent upon Ukraine for water and energy. Ukraine claims Russia has already launched an incursion into Strelkova (Strilkove) from the Crimea. The seizure of a "natural gas station" is probably a warning to Ukraine that it should not interfere with the resource links that feed Crimea. There is no evidence from open source reporting that Ukrainian military units were able or willing to repulse this incursion. This lack of resistance will embolden Russian commanders to make further incursions. The decision of one regional commander to send a combined arms task force to secure a location outside his unit's defined area of operations indicates that other Russian commanders possess similar freedom of initiative. Ukraine's options for mitigating Russian freedom of maneuver are limited. Reducing water flow from the North Crimea Canal through the Isthmus of Perekop would hurt all Crimeans and invite a Russian attempt to seize the Kakhovka Hydroelectric Power Plant that controls the Kakhovka Reservoir feeding the canal. Third Eye OSINT assesses the Kakhovka Hydroelectric Power Plant to be a critically important infrastructure node. Control of this node ensures control of Crimea. Outside The Beltway helpfully provided three maps of Ukraine's ethno-linguistic breakdown, political leanings, and natural gas pipelines at the beginning of March 2014. Knowing where Russian sympathies are strongest in Ukraine indicates areas where pro-Russian partisans are likely to block Ukraine government actions and incite unrest. The Wikipedia article on roads in Ukraine describes their general lack of serviceability but shares little detail on routes from the Russian border into the eastern Ukrainian interior. The accompanying Wikipedia graphic on Ukraine's International E-roads identifies six routes connecting Russia and Ukraine. Knowing where the E-roads connect to the Russian interior allows understanding of where Russian armored forces may stage prior to tactical maneuvers. Zerohedge's most recent infographics on Russian force commitments to the Ukraine theater compare what is known in Western media to what Ukrainian observers would like us to know. Zerohedge publishes geopolitical perspectives that are frequently intriguing and sometimes alarming; its perspectives need independent verification. The second infographic on that page is from former Ukrainian military officer Dmitry Tymchuk, who publishes an English-language blog for the Kyiv Post. That blog's header notes that it works closely with Voices of Ukraine, which is associated with the PR apparatus of EuroMaidan. Both graphical depictions generally match yesterday's State Department travel warning for parts of western Russia that are probable staging areas for Russian military units. Photos of Russian armored vehicles moving by rail to locations in Russia's western interior are widely available on the Web in English-language media, although I have not seen many in official Russian-language media. Capabilities and intent indicate a most likely course of action. Unopposed Russian incursions outside of Crimea indicate the occupying force's ability to seize critical infrastructure at will. Moscow's declared interest in ensuring the safety of Russian language speakers anywhere in Ukraine is an expansive statement of intent. It is therefore very likely that Russia will launch armed incursions into eastern and southern Ukraine. The Carnegie Endowment noted that Russian forces' initiative and tactical maskirovka have succeeded in achieving dominance. Third Eye OSINT notes that this success has come partly due to very restrictive rules of engagement for Russian forces in Crimea that have blockaded Ukrainian forces in their garrisons. Pro-Russian partisans intimidating Crimeans and foreign journalists show no such restraint. It is therefore likely that Russia will continue to employ a combination of cooperative local "volunteer" provocateurs and military units under very restrictive rules of engagement to take control of Russian-leaning parts of eastern and southern Ukraine. Temporary incursions and unrest may be sufficient to exert a level of control over parts of Ukraine that offers Russia more strategic options in engaging the West. Africa still wrestles with its colonial legacies. Pierre Englebert's State Legitimacy and Development in Africa discusses illegitimate states whose modern functions are not contiguous with their pre-colonial functions, partly due to artificially drawn borders. Their seemingly interminable corruption and inefficiency stem from the difficulty of managing these borders. These states expend enormous resources supporting themselves instead of funding vital public goods. State corruption precludes African entrepreneurs from counting on a fair shake from their own leaders. This provides a window into what is going right in Africa. Africa has room to grow. The World Bank's data for Sub-Saharan Africa shows that it lags behind the MENA region in GNI per capita and life expectancy. MENA's oil-producing countries have their own problems with artificial borders and corruption yet they outperform their southern neighbors. The oil wealth of the MENA region is not the only explanation for its advantage over the rest of Africa. A large number of the World Bank's heavily indebted poor countries (HIPC) are in Sub-Saharan Africa. None of the developing MENA countries appear in the HIPC group. The explanation for the development differential between MENA and Sub-Saharan Africa isn't as simplistic as the presence of oil in the north and the burden of debt in the south. Knowing that this disparity exists provides a context for national developmental goals; resource-rich African countries can export their way to success rather easily, while debt-burdened countries cannot. This developmental gap needs further analysis. Africa has the multilateral institutions it needs. The African Union and African Development Bank speak for the continent. Whether they speak for corrupt autocrats or ordinary Africans is up for debate. State illegitimacy casts doubt on the ability of officials to push true development agendas without lining their own pockets. Bottom-up agendas can build credibility in areas that top-down agendas can't reach. Bankers Without Borders' Sub-Saharan program has completed multiple microeconomic assessments that allow investors to bypass dysfunctional state programs. This philosophy supports the Center for Financial Inclusion's FI2020 goal of maximizing the participation of developing country citizens in the world's financial markets. Even the UN Research Institute for Social Development recognizes the importance of non-state mechanisms for socioeconomic development. Africa has the culture and infrastructure for innovation. Nigeria's "Nollywood" produces more movies than the US. The New Partnership for Africa's Development (NEPAD) is like a hybrid of the US's own intergovernmental bodies devoted to innovation. The Africa Finance Corporation channels investors into infrastructure projects, although its initial capital and membership are limited. A Google search of that organization with the word "corruption" reveals some troubling early stories of mismanagement. The World Bank's data on value-added manufacturing reveals that Africa's efforts at developing a hi-tech economy have not yet borne fruit. The Excel data download comes in handy for regional comparisons. Both the MENA and Sub-Saharan regions trail the US and world averages for the portion of the economy devoted to value-added manufacturing. Interestingly, both regions do track fairly closely to the numbers for the HIPC group. If manufacturing doesn't differentiate MENA from Sub-Saharan Africa, then resource extraction is probably the key difference between those regions. Development usually follows a clear pattern in the life of most nations, and it is hard to skip from agriculture and extractive sectors directly to high-tech innovation. The US and Germany were large agricultural producers whose exports produced excess capital available for investment in manufacturing. Many African nations have abundant natural resources. They need leaders with the foresight to convert resource exports into capital surpluses for their domestic tech sectors. The UN's Global Pulse reports on Big Data in development can show African leaders how to leverage their countries' unique gifts. There is more to Africa than its outdated Western references can describe, just as Dayo Olopade's book The Bright Continent is more than a play on words for Africa's colonial nickname. Her "kanju" self-starters take a System D approach to innovation. The M-Pesa mobile payment system is the classic result of this mentality and even MIT Sloan recognizes its value. Africans don't need to thank the West for its aid. They should instead thank themselves for remaining open to the possibilities that development brings. Two distinguished geopolitical scholars presented their analysis of "China's Rise and the Global Resource Game" at the World Affairs Council of Northern California tonight. I have not yet read their companion book By All Means Necessary but now it's on my list. I have read the China National Development and Reform Commission (NDRC) mission statements. Read them yourselves to see the Politburo's strategic intent. China's leadership absolutely believes the quest for resources bolsters its security, and that it must pursue a stronger security posture to obtain the commodities it needs. The two are so intertwined that any outside attempt to interfere with one pursuit will imperil the other. This is the fundamental fact that the West and China's Asian neighbors must understand when dealing with China. I am inclined to agree with the authors that China's state-sponsored strategy of resource acquisition is tailored to microeconomic circumstances. Coal is a terrific example. China has almost as much coal as the United States but most of it is not nearly as high in quality. That is why China still seeks to expand its coal capacity . . . by all means necessary. One factor driving China's coal quest is a resurgence of resource nationalism in Mongolia, where some major Chinese coal producers had lost major investments when Mongolia recently decided to restrict foreign ownership of its resource projects. I wonder if a PRC representative will address this at the next China Coal and Mining Expo. China's energy quest does not stop with coal, and China analysts could do more to explain the country's challenges developing hydropower, natural gas, and solar technology. China is determined to dam the Mekong and other major rivers, with little regard for the water needs of its downstream neighbors. Refer to my previous Third Eye OSINT analysis of water security, and note my discovery that China does not participate in transboundary water management (TWM) mechanisms. I will restate my belief that the US can play the role of honest broker in Asia. It may have already begun to play this role. Witness this agreement between China's NDRC and the US EPA. The US is trying to align China with international norms mitigating climate change. The next logical step is to help China build the capacity for settling disputes peacefully with its neighbors in ways that do not disrupt Asia's water-energy-food security nexus. I sometimes chuckle to myself when analysts outside the mining sector try to describe China's rare earth element (REE) mining policies. I gave an interview to the Gold Report in December 2011 on rare earth metals, and I predicted that China's ability to produce REEs would have more to do with global demand than with its export quotas. The markets proved me to be correct in 2012. The world prices of rare earth metals plummeted that year and have remained low. Investors who went all-in on REE stocks at the top of that bubble have been hurting ever since. China keeps its export quotas just high enough to exceed expected global demand, while it uses environmental laws as a stalking horse to consolidate domestic production and shut down underperforming mines. I blogged about my experience on the TREM12 panel in March 2012, where I further elaborated on my REE market analysis in front of Washington DC policymakers and mining industry big shots. I will continue to toot my own horn on this subject because the halls of power can benefit from my genius. I'll boil down China's basic REE strategy in a nutshell. The fact that China mines over 95% of the world's REE product is less important than the fact that it owns 100% of the world's oxide and concentrate refining capacity. Even REE ore mined outside China must still be shipped to China for the final metallurgy that turns it into specialty alloys for industrial use. Digging new REE mines in Canada and elsewhere gives the West little strategic leverage without a multi-year investment in the processing capacity and engineering knowledge that breaks China's real monopoly. Full disclosure: I have a small equity investment in a privately held company that is attempting to break this monopoly by establishing a world-class REE processing facility in North America. I put my money where my mouth is because I am all about solutions. I find the two authors' approach to "state capacity" intriguing. The Wilson Center has a program for building state capacity that could have been a usable framework for the US military's advise and assist missions in Iraq and Afghanistan. The NBER thinks state capacity germinates in common interest public goods. Another NBER study traces the relationship between state capacity, taxation, and conflict. Nation-building is a big topic for another article, but there are simple metrics for assessing state capacity. The two authors' example of China's desire to import timber from Russia left me wondering which state they consider to be stronger. It may be a question of which state is less dysfunctional, or which is less captive to an oligarchical elite. Consider some comparative metrics for these two countries. Transparency International's Corruption Perceptions Index ranks China 80th and Russia 127th. The Heritage Foundation's Index of Economic Freedom ranks China 137th and Russia 140th. The World Bank Logistics Performance Index ranks China 26th and Russia 95th. Standard and Poor's rates sovereign credit as AA- for China and as BBB to BBB+ for Russia. Freedom House's Freedom In The World Index rates China as 6.5 and Russia as 5.5 (on a scale where 1 is best and 7 is worst). It looks to me like the People's Republic of China is a stronger state than the Russian Federation almost across the board. Russia is slightly higher on Freedom House's scale but both countries are pretty much in the basement on that metric. Adding more metrics can provide a fuller illustration. I like hearing from the World Affairs Council's guests, especially when they come all the way out to San Francisco from the Council on Foreign Relations. Now it's their turn to hear from me. I would be overjoyed to add my own perspectives to the CFR's deliberations if someone would be generous enough to sponsor me for membership. The CFR needs market expertise that bolsters its geopolitical bench strength. Come and get it from Yours Truly, Anthony J. Alfidi, aka "Greatest Man Who Ever Lived." The Commonwealth Club was the latest stop on the tour for The Two Koreas, an updated look at modern US diplomacy in the "land of morning calm." I have not yet read The Two Koreas so it's going on my watch list for my next trip to the SF Public Library. The political division of Korea is one of the last Cold War legacies on the planet, aside from the Castro regime in Cuba. The North Korean regime exhibits behavior that the American negotiators of the Agreed Framework do not completely understand. The Clinton Administration negotiated the Agreed Framework in the 1990s with the Kim family regime. The IAEA had already discovered that the DPRK was in violation of the Treaty on the Non-Proliferation of Nuclear Weapons (NPT). Negotiating in good faith with a regime proven to break faith with agreements is thus an exercise in futility. This wisdom is lost on Western diplomats who think Oriental despots can be trusted to keep their word. The Agreed Framework itself allowed lopsided US concessions to the DPRK and next to nothing in return. What little the DPRK promised was renewed adherence to the NPT, which of course it later abrogated with nuclear tests. I am profoundly disappointed at the immaturity of key US diplomats who were witness to this willful negligence of US strategic interests in the 1990s. Political determination to pursue a questionable diplomatic goal should be grounds for career diplomats to raise strenuous objections. It is difficult to describe the Clinton Administration's policy toward North Korea as a success given the high costs the US paid for the illusion of progress toward normalization. JPAC's ability to dig up the North Korean countryside for US servicemembers' remains depended on millions of dollars in aid incentives. The Bush Administration was still releasing funds to North Korea in 2002 under the Agreed Framework, even though it declined to certify the DPRK's compliance. North Korean intransigence shredded what remained of the agreement. Competent diplomats could have seen that coming based on North Korea's demonstrated diplomatic record of duplicity. Independent assessments of light water reactors (LWRs) make it clear that they can still produce weapon-grade plutonium. The GAO's EMD-79-15 report made it clear during the Carter administration that light water reactors were not proliferation-proof. This NPEC study from 2004 is similarly clear on LWRs' Pu capability. The IAEA-SM-367/15/08 paper also made this clear. Any competent diplomat could have leaned on the US intelligence community's technical specialists to confirm that a gift of an LWR to a hostile state will not hinder nuclear weapons development. American diplomats should not view strategically questionable agreements as resume builders, time fillers, full employment programs, or bestseller book material. Unfortunately, that is the Agreed Framework's legacy. Coercion could have succeeded in curtailing the DPRK's nuclear ambitions where the Agreed Framework failed. North Korea's Room 39 (or Office, or Bureau, or whatever) is the Kim dynasty's primary source of slush fund revenue from illicit activities worldwide. The Bush Administration launched a comprehensive plan to take apart Office 39 but for some reason never completed it. Comments on several websites that summarize reports from North Korean defectors are revealing. Some of these comments indicate that this US effort to shut off North Korea's illicit funding forced the Kim family to make policy changes. The Kims and their entourage approach all foreign dealings, including diplomatic efforts, as a matter of personal survival. The Kim dynasty cannot maintain its extravagant lifestyle, its bribes to internal KPA and WPK factions, and its WMD programs without illicit sources of foreign funds. Third Eye OSINT is convinced that a serious effort to shut down Room 39, its successors, and other Kim regime extralegal funding mechanisms remains the most promising US interagency option for eliciting diplomatic compliance from the DPRK leadership. The US Treasury designated two banks as nodes of Office 39 in 2010. It's good to know that at least one US agency is keeping up the pressure. Any claim that the US is unable to monitor North Korean compliance with nonproliferation accords is very difficult to believe. The US has long maintained national technical means that enable it to monitor Russia's nuclear arsenal. This surveillance, together with IAEA physical site visits, has been sufficient to catch North Korea in the act of violating its agreements. The US does indeed lack a diplomatic capability to assess the intent of leaders in closed societies. Diplomatic scholars should revisit classical works on Confucian thinking to recognize the ancestor worship and other forms of filial piety the Kim regime demands of its people. The dead hand of old thinking is alive and well in North Korea. The United Nations Human Rights Council (UNHRC) Commission of Inquiry on Human Rights in the DPRK completed its report in February 2014. The objective evidence for barbarity inside the DPRK is as incontrovertible as it is appalling. News of North Korea's horrors has been available through open sources such as NK News, DailyNK, and various defector sites. Barbaric regimes do not comply with civilized directives. This obvious inference escapes US diplomats and intelligence professionals who engage their North Korean counterparts as if an exchange among equals is possible over coffee in Geneva. Such a comity is impossible so long as barbarity remains unchallenged. The idealists at the Ploughshares Fund's North Korea section put too much faith in international norms against proliferation. Barbarians do not subscribe to norms. They understand threats of punishment backed by demonstrated strength. Operation Paul Bunyan resolved the JSA axe murder incident on favorable terms for the US and South Korea. Resolute coercion can make such a difference today. The US tends to mishandle its relations with at least one of the two Koreas at any given time. Misguided diplomatic openings to the North risk alienating the South. It stands to reason that South Korea should be the lead international actor in dealings with its forlorn northern twin. The Republic of Korea has matured into a modern democracy that ranks very high on numerous global measures of health. The Democratic People's Republic of Korea ranks at the bottom on almost every conceivable measure. The US's wisest move would be to defer to its strong ally South Korea in all future negotiations with North Korea. Koreans understand their kin better than US diplomats who pursue negotiations for their own sake. The confrontation in Kiev between government forces and protesters has turned deadly. The difference in how Western media and Russian media portray this conflict has become a trope. Russia sees right-wing coup plotters where the West sees neoliberal modernizers. Open source reporting reveals interesting details. The WaPo reports that a Polish diplomat tweeted a panicked mood in the office of Ukraine's head of state. This is a notable revelation given Poland's close ties to Ukraine. A stable country has no interest in revealing an ally's weakness unless said ally's regime is in mortal peril, in which case the diplomatic penalty for such a revelation is minimal. The Ukraine's pro-West opposition has occupied government buildings, burned official documents, and captured Interior Ministry police. Some protesters appear to be firing weapons at police. That indicates a level of organization and commitment far beyond that of a peaceful protest movement. The Financial Times reports on the possibility that the Ukrainian military will intervene to crush the protests. That is premature despite the removal of a senior Ukrainian commander who expressed a reluctance to intervene. The order of battle in Kiev appears to favor the Interior Ministry against the protesters. Kiev would likely only commit its military if the protesters achieved some sort of breakout by repulsing the Interior Ministry in a decisive battle or seizing more government buildings. The Washington Examiner reports that the US Secretary of Defense has not been able to contact his Ukrainian counterpart. This is important in light of the FT's description of Ukraine's decades of NATO contact through unit training and officer education. If Ukraine's national leadership were preparing a military response, the planning would preclude contact with other nations' counterparts to avoid tipping its hand. American theory about insurgency holds that genuine grass-roots insurgencies begin among disaffected classes, typically in rural areas, and only spread to capitals after establishing bases of support in the countryside. The opposition in Ukraine seems most active in Kiev for the moment. Its success in confronting the pro-Moscow government has nothing to do with whether it can hold government buildings against the Interior Ministry. It has succeeded in exposing severe disconnects in governance between the nativist western parts of Ukraine and the pro-Moscow Russian ethnic enclaves in the east. It is unclear at this time whether the cities in western Ukraine that have expressed autonomous sentiments have backing from elements in the Ukrainian military. The pro-Moscow regime in Kiev has a short window in which to rout the protesters. If it does not rout the opposition, the risk of full civil war is high. If the Ukrainian military is indeed so split that its commitment to support the Interior Ministry would precipitate a larger crisis, then no national institution could hold east and west Ukraine together . . . in the absence of foreign intervention. Yesterday I went to the Commonwealth Club for what I expected to be a good lecture on the rise of China. The presenter, Orville Schell, was a vaunted old China hand from the Asia Society, one of the most trusted names in the think-tank world. The Commonwealth Club has pushed this topic before, and I'll note for the record that I have not yet read Wealth and Power. I need to read it to understand why this coverage of China's rise leaves out a significant number of salient details. I have no argument with the thesis that decades of humiliation at the hands of Western powers motivates Chinese nationalism, and this resurgent nationalism in turn has motivated China's strong economic growth. My own thesis is that Western observers are once again missing other unique forces driving that nationalism. Ignoring these forces means the West will once again misjudge future turning points in China's internal development and external strategy, just as it missed the turn to modernization after the Cultural Revolution. The "Chinese Dream" of wealth and power that will secure China's identity is more than some belated response to 19th century colonialism. China's governmental style has never lost its Confucian foundation despite Mao's efforts to break down traditional Chinese cultural traits. The Chinese Communist Party simply subsumed the old patronage relationships that always characterized imperial China. Only the images changed, and grafting the Party's authority onto a suborned governing structure does not change the Confucian nature of its authority. Modern Chinese interpret the "mandate of heaven" as continued economic growth. Failure to meet this expectation will cause China's emerging bourgeoisie to question the Party's legitimacy. That question is about a decade away from becoming reality by virtue of demographics. China's unassimilated minorities must figure into any Western analysis of that country's stability but Western analysts disappoint me by continuing to refer to China as monolithic. This failure to see ethnic nuances is one fatal flaw that early scholars of Oriental despotism such as Karl August Wittfogel never corrected. The PRC's own written constitution refers to the "nations of China." China's insecurity, as expressed in its reassertion of historic claims over seemingly inconsequential islands, is the product of an unfinished nationalist attempt to reconcile some irreconcilable minorities to Han and Manchu primacy. Nationalism as a unifying impulse is the only way China can contain restive Tibetans, Uighurs, and Mongolians when economic growth begins to falter. China's unresolved territorial disputes with India over Arunachal Pradesh (aka South Tibet) and other areas are the perfect future rationales for more saber-rattling. I do not expect those areas to be quiet for long once China is unable to meet its own middle class's economic expectations for a "mandate of heaven" in its standard of living. Oh BTW, those seemingly inconsequential islands are fairly consequential after all. Securing unchallenged basing rights to uninhabited rocks allows China to extend its exclusive economic zone under UNCLOS far beyond its coastal waters. This provides legal precedent for regulating fishing, crabbing, and even ocean transit in a manner that reflects the tributary relationships imperial China once imposed upon its weaker Asian neighbors. China's desire to assert an air defense identification zone (ADIZ) over the entire East China Sea reflects the same impulse. The US Navy guarantees freedom of navigation through Pacific sea lanes, free of charge to all comers. There is no assurance in Asian history that Chinese naval dominance will be as generous. Any PLA Navy attempt to charge a tariff for transit will provoke an outcry that will demand an international response. Chinese nationalism is not the self-deterministic expression familiar to Western scholars. It is a resurgence of the ancient imperialist impulse that runs through much of China's pre-modern history. The Beijing Consensus uses economic development and nationalism to restore China's self-image as an empire. The Chinese Dream is the domestic mythos covering that policy consensus. Faltering economic development means nationalism becomes the stronger impulse to maintain the unifying self-image. This is why neoliberal interpreters of the Washington Consensus for economic development misapply the Beijing Consensus as a competing development model for emerging markets. It is no such thing. It is traditional Chinese imperialism, directed simultaneously at China's unassimilated minorities and weaker neighbors. Western analysts can increase their understanding of Asian dynamics by updating some forgotten concepts like the hydraulic empire without Wittfogel's ideological limitations. Himalayan hydrology has everything to do with the water-energy-food security nexus driving China's internal development and its relationship with India over contested territories. The Asia Society and Commonwealth Club should study this Alfidi Capital thesis in more detail. I'm available for speaking engagements in front of VIP audiences, if you know what I mean. Samuel Taylor Coleridge's "Rime of the Ancient Mariner" pondered "Water, water, every where, nor any drop to drink." That's one of the coolest lines I've ever seen in literature. It's also a cool segue to discussing risks to global stability from a lack of access to potable water. Three fourths of the earth's surface is covered in water but only a small amount is fit for human consumption. That small amount will be subject to competition in the years ahead. The World Resources Institute studies water risk through its Aqueduct global mapping tool. I mentioned last year that a China-India resource conflict within 15 years (thus, by 2028) is my pet theory. The Aqueduct map shows India more stressed for water than China in each scenario. Perusing the Aqueduct's supporting publications reveals those river basins under the most stress from water extraction. A large number of the highest-risk basins are in China, Central Asia, and the Middle East. Water supply risk gets a special mention in the World Economic Forum's Global Risks Report for 2014. This report cites food and water crises as major risks but does not link them to a water-energy-food nexus that implies tradeoffs and prioritization of efforts. A couple of paragraphs in Box 1.3 on page 15 do not do the topic justice. I find it odd that the report places both water and food in the upper-right quadrant of its global risk matrix but an oil price shock is in the lower left quadrant. It seems to me that an energy price shock in the water-energy-food nexus will almost immediately drive secondary effects in water and food. The vulnerability of water production industrial control systems to cyberattack is another risk the WEF identified separately, even though that can also impact the water-energy-food nexus. The UN's World Water Development Report (WWDR) will be an annual guide for policymakers once the next edition comes out this year. While we wait for that publication, the UN-Water Analytical Brief from October 2013 expands upon the water-energy-food nexus as a basis for security. The most positive observation in that brief is the recognition of transboundary water management (TWM) commissions where neighboring countries can discuss water management. I am unclear at present whether these commissions can adjudicate disputes as binding arbitrators; I'm guessing that they cannot unless they point to signed UN conventions or other sources of international law. I like that the brief assigns a dollar figure to watershed management in some regions. My first glance impression, based on the above studies and what I learned at the WorldAffairs 2013 conference last March, is that Pakistan will come under water pressure first and most severely of all the potential crisis regions. Pakistan's water from the Indus River originates in India. Pakistan will face a tradeoff between agriculture and hydropower if it doesn't get enough water for both functions. This will force it to play an increasingly destabilizing game provoking India via Kashmir. India will be tempted to retaliate by extending its influence into Afghanistan as a back-door way to destabilize Pakistan. New Delhi is already preparing this strategic option by extending diplomatic and military overtures to Kabul. India can win a conventional conflict with Pakistan over water access, provided the conflict does not go nuclear and China does not intervene with military force. The Middle East is a different story. Every major Middle East river is shared by two or more nations and national borders do not coincide with watershed boundaries. Water is more important than oil because it has no substitutes, but the Middle East's vast oil and gas resources enable it to adapt water infrastructure to the region's needs. Water systems present attractive terrorist targets but shared management among regional rivals can be a basis for cooperation that deters state-sponsored groups from attacking infrastructure. The Middle East Desalination Research Center (MEDRC) offers a way forward that is neutral toward infrastructure for delivery, as almost every Middle East nation borders the open sea and most are wealthy enough to afford desalination technology. Water shortages are relevant to Syria's instability, possibly more so than the Arab Spring. The country's population growth stressed its environment and a multi-year drought from 2006-11 drove millions of rural dwellers into food insecurity and urban migration. The Assad regime subsidized water-intensive crops, favoring inefficient techniques (i.e., flooding over precision irrigation) that overdrew groundwater. There's no shortage of knowledge about water resources. I believe TWM entities will find it useful. Trade in food and other commodities represents the transfer of virtual water, or embedded water, between regions. The Global Water Partnership (GWP) has a useful toolbox for applying integrated water resources management (IWRM) that impacts the virtual water trade. The Stockholm International Water Institute (SIWI) awarded its most prestigious prize to the CGIAR International Water Management Institute (IWMI) and helps implement the UNDP Water Governance Facility (WGF). These are all transnational sources of best practices. Applying their lessons in Asia and the Middle East requires TWM bodies ready to go to work. The lack of reputable TWM organizations in the Middle East and Asia will be a detriment to regional stability. Arab recalcitrance over the US-sponsored Jordan Valley Unified Water Plan was a partial cause of the 1967 Six-Day War. The only TWM organization covering Israel and its Arab neighbors I have found is the Arava Institute's Center for Trans-boundary Water Management. The Carnegie Endowment presented its "Blue Peace" comprehensive IWRM plan in 2011, but I do not know whether any Middle Eastern nations signed on for implementation. The Indian-based Strategic Foresight Group published "Water Cooperation for a Secure World," regarding the potential for water resource cooperation to reduce the risk of war. My Web search for evidence of water cooperation between India and China indicates the two countries have been willing to share data, but long-term cooperation is hampered by their border disputes. The world's water problems present an opportunity for the United States to emerge as an honest broker in regions key to its strategic interests. The US can use a DIME-based outreach via USAID water and sanitation development programs focusing on efficiency and demand reduction. The DIME approach's success metric should be a reduction in the target region's water footprint, using the Water Footprint Network's data. Leveraging the World Bank's work on water development will give the DIME effort credibility. Asia and the Middle East will have to manage their water resources in different ways, with or without US assistance. The UN FAO Natural Resources and Environment Department has data and programs useful in resolving water disputes, most of which are now sub-national. If regional rivals cannot peacefully adjudicate water disputes through TWM commissions, they will come into conflict. There is no substitute for water. The Pacific Institute maintains a Water Conflict Chronology. The list of conflicts is likely to grow in the future. US Secretary of the Navy Ray Mabus spoke last night at the Commonwealth Club. I attended to hear him speak on the US Navy's efforts to adopt renewable energy sources. The entire event was recorded for the CW Club's Climate One series so I don't need to repeat much of what the Secretary said. His talk shed some intriguing light on how the availability of energy affects a navy's power projection capability. Secretary Mabus mentioned that biofuel has a higher octane rating than petroleum-based fuel. He did not mention the specific composition of fuel the Navy was using in its Great Green Fleet so I don't know whether he meant E85 or some other blend. I like that the name of this technology demonstration invokes the Great White Fleet's demonstration of US power projection during its rise as a world power. He also mentioned an experimental underwater autonomous vehicle that can make its own fuel from ocean water and sea floor biomass, giving it the ability to stay at sea indefinitely. These two projects together may greatly reduce the need for US Navy ships to receive underway replenishment (UNREP). The freedom of maneuver this will grant a naval force is phenomenal because ships can spend more time on station and can avoid port visits that increase security vulnerabilities. The cost of biofuel has been a minor political football in Washington, DC. The USDA's Economic Research Service publishes regular updates on the market for biofuels. The USDOE EERE Alternative Fuels Data Center compares biofuel prices to more conventional fuels. Ethanol is clearly more price competitive than biodiesel but the federal government subsidizes its production. Independent studies from the International Institute for Sustainable Development’s (IISD) Global Subsidies Initiative (GSI) of biofuel subsidies in several countries show that they are expensive ways to reduce greenhouse gas emissions. Production costs can fall with scalability if demand increases. US government agencies, as they have done throughout American history, are providing demand in the interest of national security. The Defense Production Act is the government's legal means of requiring the private sector to produce goods that meet the nation's security needs even if no market exists. An interagency committee (DPAC) runs study groups that publish capability assessments, and the DPA Title III portal publishes contracting opportunities. Secretary Mabus mentioned a security premium that oil traders include when submitting orders for oil contracts. This premium plays havoc with the Navy's budget by forcing it to divert O&M funds to unbudgeted fuel costs. The premium's volatility increases with instability anywhere among oil-producing regions, even when minor producers (like Syria, which sells very little oil to the West) experience instability. Resources For the Future (RFF) published a study in 2010 indicating how increased US domestic oil production dampens the price shocks from instability, but overall reductions in oil consumption do more to enhance security than source substitution. That study built on work the authors did for Stanford University's Energy Modeling Forum in 2009 when they examined a method for estimating the US oil price premium. This research is an argument in favor of more biofuel production, which comes with its own premium as I noted above. More audiences outside the US need to hear what Secretary Mabus said about how US hegemony enables freedom of navigation through the world's sea lanes and around crucial choke points. The US State Department outlines the US freedom of navigation (FON) program but does not mention the US's refusal to sign the United Nations Convention on the Law of the Sea (UNCLOS), which degrades our ability to defend US commercial claims at sea. The USDOE EIA's World Oil Transit Choke Points show where the US Navy's presence does the most good for the world economy. Petroleum shipping would be far more hazardous without the Navy on duty. Shipping oil across the English Channel during World War II was hazardous due to German Luftwaffe attacks. The Allies had to build Operation Pluto's cross-channel pipeline to keep oil flowing to US and British forces on the continent. Undersea pipelines are practical in some areas, such as the Langeled pipeline from Norway to Great Britain, but they face economic and technical limits over long distances. It was interesting to hear the Secretary mention vessel mission planning as a fuel cost reduction method. Prevailing currents deserve consideration for programmed routes of known length and duration, and commercial shipping lines are correct to pay their captains some incentive bonus to save fuel costs by using old-school knowledge of currents and wind. This is good for the Navy in peacetime when tour routes are known but wartime cruises will be mission-dictated. Commercial shippers also sometimes mount a large hard sail on a ship's bow so prevailing winds can reduce steaming costs. That won't work on a modern Navy ship as it would interfere with systems for guidance and fire control. Even the best ideas have limits. The renewable energy push has begun to permeate all of DOD. DLA Energy addresses multiple energy needs for its DOD customers but I did not see them listed as participants in the Defense Energy Summit for 2013 or the Defense Energy Technology Challenge for 2013. I know from personal experience that DLA has tasked analysts to assess the national security impact of resource shortfalls. I hope DLA is part of the US government's renewable energy effort, but hope is not a method. World shipping needs the US Navy, and the Navy needs energy. More renewable energy means more freedom of maneuver for the Navy. More demand from government purchase requirements leads to more industry capacity and more opportunities for green businesses. Contractors seeking government opportunities in smart grids, microgrids, and net-zero facilities should review the EPA's green regulation initiatives and the SBA's green business guide. There's money to be made in selling to Uncle Sam. I read with interest Andrew Bacevich's recent article "One Percent Republic." I compared it to the notes I took when David M. Kennedy presented The Modern American Military at the Commonwealth Club last year. Both Prof. Kennedy and Col. Bacevich accurately describe America's relationship with its citizen-soldiers after more than a decade of war against Islamic radicalism. The Bacevich article could read very well as the follow-up to the Kennedy anthology. Modern describes how the all-volunteer force allows the US to conduct war with reduced accountability to the American people, and "One Percent" describes the resulting alienation of the American people from their military. Kennedy, in his talk, contrasted the high ratio of general officers whose children serve in uniform with the low ratio of Congress members whose children serve. Anecdotally, I have observed a high degree of multigenerational service among officers below flag rank. The Society of the Cincinnati and other hereditary orders are the closest thing the United States has to an aristocratic nobility. I used to wonder whether those officers fortunate enough to perform duty in and around the Military District of Washington were able to leverage any hereditary connections during their careers. There's even a Hereditary Society Community to keep track of all these hereditary societies. I looked at the pictures of their annual reception . . . held in Washington DC, of course. Pedigree matters in America. Trace your lineage to a hero of our past wars and you get invited to high tea with people who don't have to fight in our current wars. God bless America. American expeditionary deployments have indeed increased dramatically since the all-volunteer force came into being after the Vietnam War, as Kennedy noted. Americans are simply no longer interested in being accountable for war. It's just another spectator sport providing amusement to a passive public. This fulfills the prophecy Samuel Huntington made in The Soldier and the State in the 1950s that the American people would become more traditionally conservative in their tolerance of a large defense establishment. Little did he realize just how conservative they would become. American "conservatism" today primarily conserves Wall Street's grasping ethic and the middle class' unfunded entitlements. Its liberal opposite is more like a Siamese twin, conserving and expanding every benefit program that progressive academics dreamed up. TR Fehrenbach described in This Kind of War how liberals and conservatives checked each other's power and informed each other's ideas constructively during WWII and the early days of the Cold War. The balanced dynamic has given way to a Janus-faced pantomime of difference, regardless of partisan noises. Americans could write the next chapter in their history but they now prefer it to be ghostwritten. Watching reality TV is more compelling. Americans want handouts and our plutocrats know how to keep us pacified. A people who lose interest in the burden of self-governance invite the entrance of actors who will lift the burden from their shrugging shoulders. Bacevich notes the entrenchment of wealth at the apex of society, and Kennedy notes the military establishment's freedom of action in crafting policy. We will soon see whether plutocracy and stratocracy can co-exist in America. The Founding Fathers' own aristocratic pretensions often go unnoticed, and they intended the Electoral College to represent the nation's most enlightened beings. This new elitist phenomenon isn't all that new anyway. Generation X has a saying for all this . . "whatever." Nota bene: This article is dedicated to the memory of TR Fehrenbach, who passed away last month at the age of 88. His passing received little note in news media. I will never forget reading This Kind of War while on active duty in South Korea in 1995.